My great grandmother’s signature dessert was the Lemon Supreme Bundt Cake from Duncan Hines. I don’t remember her making it for special events or parties, but she made it for the family quite often and she’d always let me pour on the glaze. It was probably my introduction to baking. This week I was thinking about my grandma and bought a box of lemon cake mix. I wasn’t sure what to do with it until this morning, when I got an idea to use it as a base for mini cheesecakes baked in a bar cookie pan (Update: Looks like the Calphalon site is out, so you may have to do a Google search using “Calphalon Classic Dessert Bar Pan” if you want that particular pan. There are other brands available, but that’s the only one I’ve used). The idea worked perfectly! The flavor of the lemon cake was just as I’d remembered it, but I couldn’t help thinking how good these would be with a simple vanilla cake mix base. I guess that’s next on the list, but I feel pretty confident you could do the bottom in just about any cake mix/pudding combo you wanted. Lemon cheesecake squares made in a Calphalon nonstick bar cookie pan. Preheat oven to 350 degrees F. Spray 12 squares of a Calphalon Classic bar cookie pan with flour-added baking spray. With an electric mixer, beat the cream cheese and sugar just until smooth. Add the egg white and mix on the lowest speed of mixer just until blended -- do not overbeat the egg white; stir in the sour cream. Set aside. In another bowl, mix the cake mix, pudding mix, egg, oil and water and beat with a hand held mixer until smooth. Spoon tablespoonfuls of lemon batter across bottom of each square and gently spread so that each square is covered. Put a generous tablespoon of cream cheese batter over the lemon batter. Bake for 18 minutes or just until the tops and bottoms appear set. Let cool for about 10 minutes in the pan, then carefully pry cakes out of pan and set on a cooling rack. Transfer to the refrigerator to cool and chill. for the garnish, put a bit of blueberry ice cream topping in the middle, or put some white chips in a heavy duty freezer bag, microwave on high for 30 seconds, knead bag a little, and repeat until melted. Snip off bottom corner and pipe over cakes. If you don't have a square bar pan, you should be fine with a muffin cup and paper liners. Store your leftover cake mix in the freezer. I usually empty it into a freezer bag, label it, and store it in the freezer. You can use the remaining cake mix in another batch of these, or use it to make a half batch of cupcakes. Thanks Rynda! I added a note. This is the second time that’s happened (sites running out of pans). Surely other sites are selling it, so a Google search is probably the way to go. I need to try some other brands of dessert bar pans, but I really do enjoy the Calphalon. The bar cookie pan link says that the pan is no longer available. Sometimes it’s good to go for these items when you see them first! Those are adorable! I was just looking at a pan like that and debating whether or not to get it. a perfect little bite! Should you be giving one away…..
With a kitchen scale, you can measure out exactly how much cake mix you need for any recipe. I could use it in a batch of cupcakes, make a half cake, make another batch of these, or use it in a cake mix/scratch cake hybrid. Also, after I open a box of cake mix I put it in the freezer. I should add that to the notes. I love the story too and never heard of that cake–although according to the website it was a ‘standard’ in many households! But what are you going to do with the left-over cake mix? Martha, if you don’t have a bar cake pan you could probably just use your muffin pan and line it with paper liners for little round cheesecake cups. These look scrumptuous! Back in the 70’s there was a Lemon Blueberry Bundt Cake mix (maybe a Pillsbury) that I used to buy. Okay, so what if we don’t have that cute little baking pan? Would a 12-cup muffin pan work? I’m thinking a Jiffy lemon cake mix would be great for this. I admire how you think outside the “box”! Love trying new recipes that use a cake mix! These look delicious. Nice memory of your grandma! 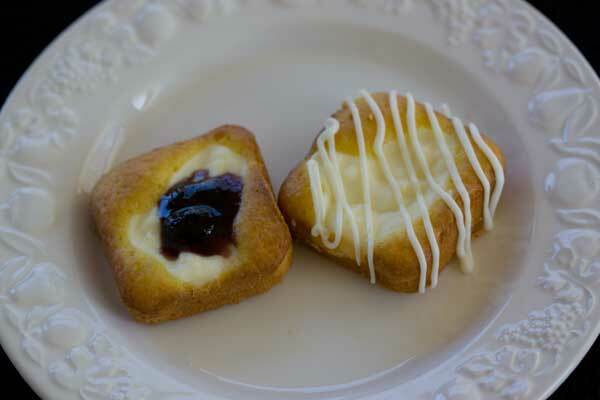 The Danish and Cheesecake Squares look really good. Aww I love that story! The little Danish squares look great. I really do like boxed lemon cake.